Mootopia | a fans-eye view. 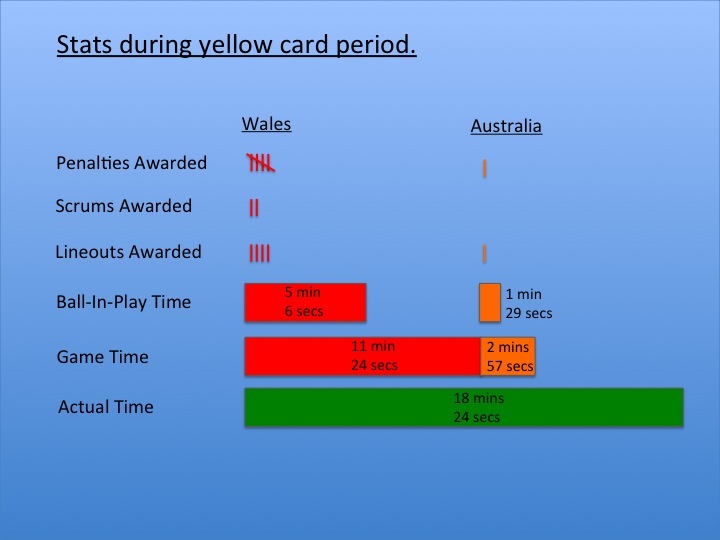 The 14 mins where Aussie ranks were depleted due to yellow cards took 18 mins to complete with the ball in play for all of 6 mins 36 secs (with about 5 mins of that being in Welsh hands). One of the two Welsh scrums took 2 mins 41 secs of the 10 min period where Aussie were down to 13 men. You have to question the logic of choosing the lottery that is the scrum when a line out, penalty move or even a kick at goal would deliver a more reliable and time efficient outcome. On a different day one of the three scoring opportunities during this period would have landed and / or another yellow card would have been issued. But you have to take your hat off to the Aussie defence, incredible. 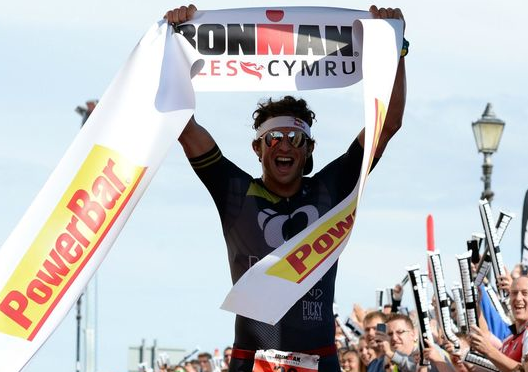 US endurance sport athlete Jesse Thomas won the 5th Ironman Wales in Tenby yesterday. Thomas’ season had been focused on the Half Ironman World Championship held in Austria at the end of last month. However, a controversial 5 min penalty incurred during the cycle leg brought a four year commitment to the event to an end and tears to his eyes as his 5th place position and goal of a top ten finish evaporated. So what does someone with a Welsh surname and a passing resemblance to Lee Halfpenny do in these circumstances? Obvious really, compete in and win your first full Ironman event having only ever cycled 112 miles once in your life (12 years ago) and never having run a marathon (Mr Thomas had run 20 miles but that was 15 years ago). And decide to do this a couple of weeks out from the event. Good on you butty. He passed me as he finished his swim (I was starting my second lap) and on the bike too (he was finishing his second lap, I was on my first). So congratulations to Jesse Thomas, Wales salutes you. And with the 2015 Rugby World Cup kicking off this week and the great Lee Halfpenny laid-up injured, Wales wonders whether you have a Welsh grandparent and whether you can turn your hand to place kicking and full back play as effectively as your moved to Ironman. Sports writer and journalist William Fotheringham provided an overview of the career of Bernard Hinault at Hay Festival today. 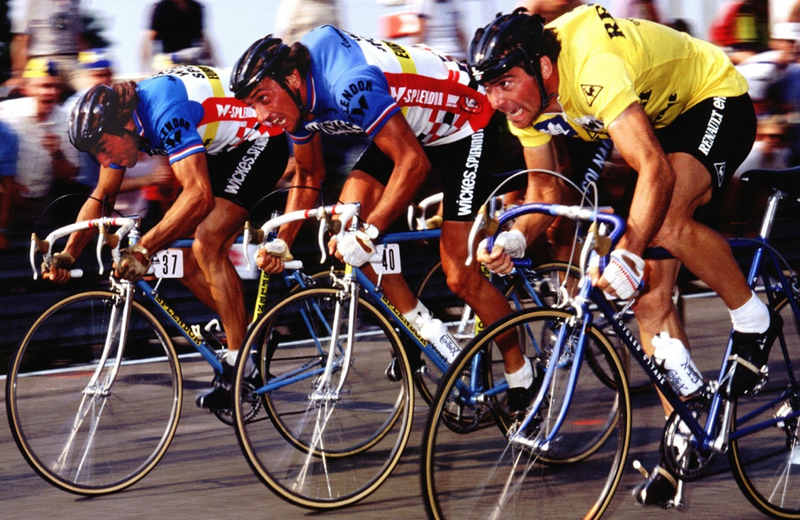 As one of the greatest cyclists of all time Hinault won the Tour de France five times and is the only man to have won each of the Grand Tours on more than one occasion. Fotheringham firmly places Frenchman Hinault as the last ‘old-school’ champion: a larger-than-life character from Brittany farming stock who was an out and out competitor (as is evident from the above photo where as race leader he takes on the sprint finishers at their own game – a scenario that would almost certainly not occur in modern cycling). In the Q&A session the question was posed the Fotheringham “if Hinault had been British how would his career have been different?” Our esteemed host hypothesised that the equivalent up-bringing in the UK would have seen Hinault born the son of Devon farmer. As “farmers did not ride bikes in the seventies” this would certainly have ensured that he never became a professional cyclist. But a man of Hinault’s competitive nature would have required a sporting outlet and so rugby would have been the natural choice. Fotheringham envisaged him as a Graeme Dawes, tough as teak, never-say-die rugby player. Dawes was capped 5 times by England and played as a professional for his home town club, Plymouth Albion, into his 50s. He is the first person to play rugby professionally at this age. The captains of the Six Nations teams were required to sit in the front row of the audience before taking the stage at the Six Nations Championship launch. The seats were slightly too small and slightly to close together to make this a comfortable arrangements with Paul O’Connell, Sam Warburton and Sergio Parrisse choosing to lean forward to avoid invading the shoulder-space of Chris Robshaw, Greig Laidlaw and Thierry Dusautoir. How polite. 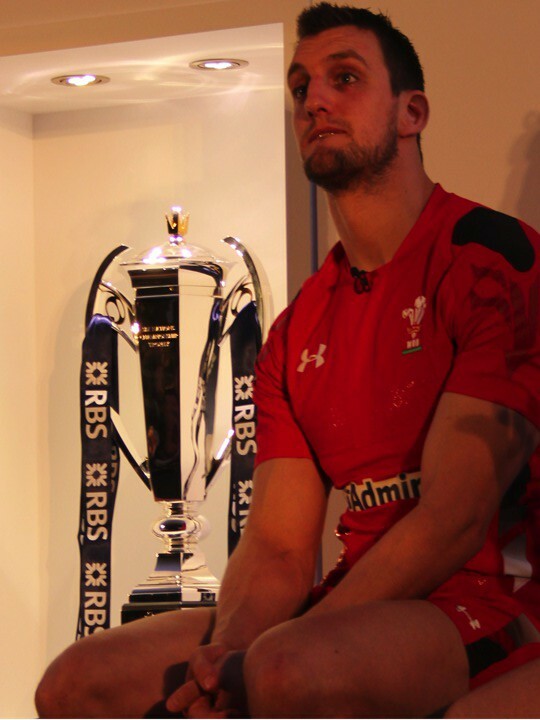 At the Six Nations Championship launch today the new trophy was revealed. The previous five-sided trophy has been replaced by a six-sided one with each face representing the six individual countries, with their name and date they joined the tournament (or earlier versions of it) engraved on the face. Perhaps it should be four-sided trophy as it seems likely that only Ireland, England, France and Wales have a realistic chance of winning it for the foreseeable. 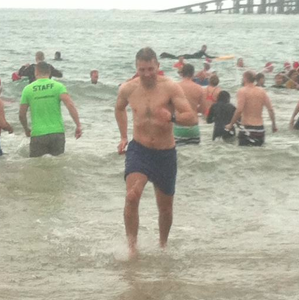 Tenby – confirmation that an 11.1°C sea without a wet suit is cold. But not as a cold as I expected it to feel. That was the temperature I measured on Boxing Day at Tenby for the annual winter ‘fun’ swim. By my reckoning about 2-300 entered the sea off the North Beach, Tenby, screamed and splashed around a little (reminding me of a scene from Titanic) before making their way out swiftly to stand around a very welcome pallet-wood bonfire while being rained on. Everyone seemed happy and full of life despite the conditions. And I can also report that Top Joe’s probably does deserve it’s ‘2nd best pizzeria in the UK’ ranking by TripAdvisor. Lunch was great. Jacky Lorenzetii the French property tycoon and owner of Racing Metro was asked about his signing of Mike Phillips and the ‘off field behaviour’ issues which have accompanied the Lions player. 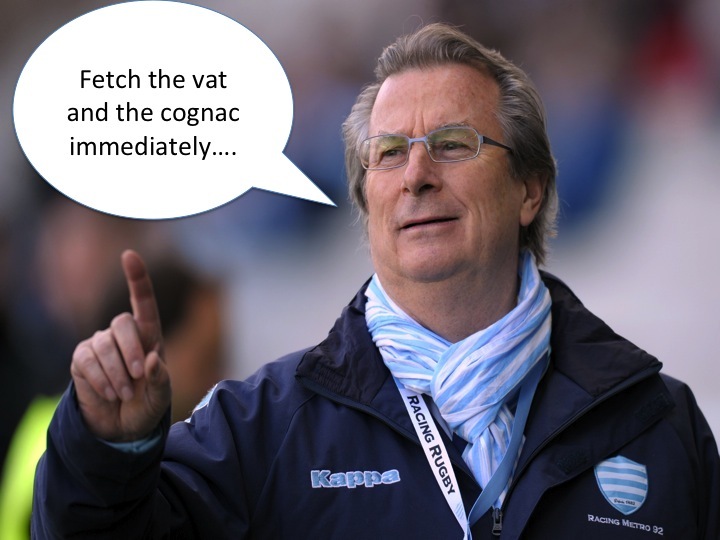 After a second successive mauling at the hands of Harlequins, a result which effectively confirm their early Heineken Cup exit of the expensively-assembled French side, he may wish to arrange for the vat to be delivered.